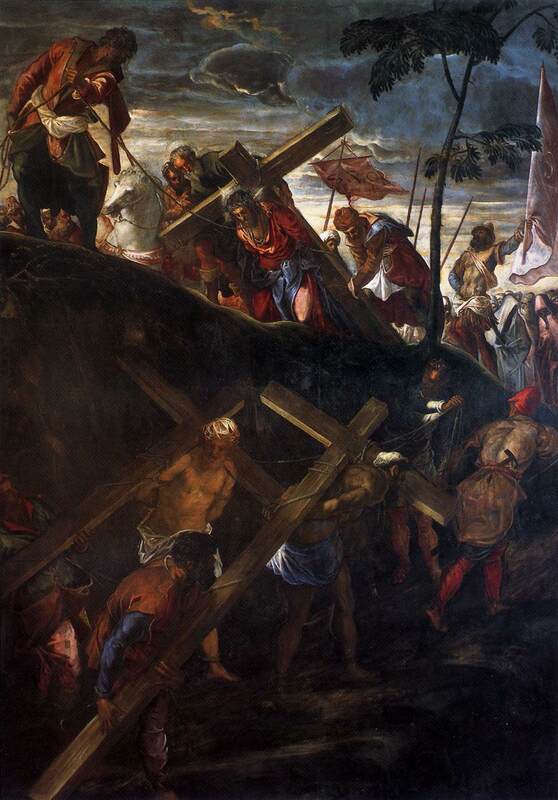 Jacopo Tintoretto (c 1518-1594), Ascent to Calvary (E&I 128) (1566-67), oil on canvas, 285 x 400 cm, Albergo, Scuola Grande di San Rocco, Venice, Italy. Image by Sailko, via Wikimedia Commons. In 1565, Jacopo Tintoretto took a short break from his painting for the albergo of the Scuola Grande di San Rocco to paint a commissioned work for the church of San Cassiano, also in Venice. 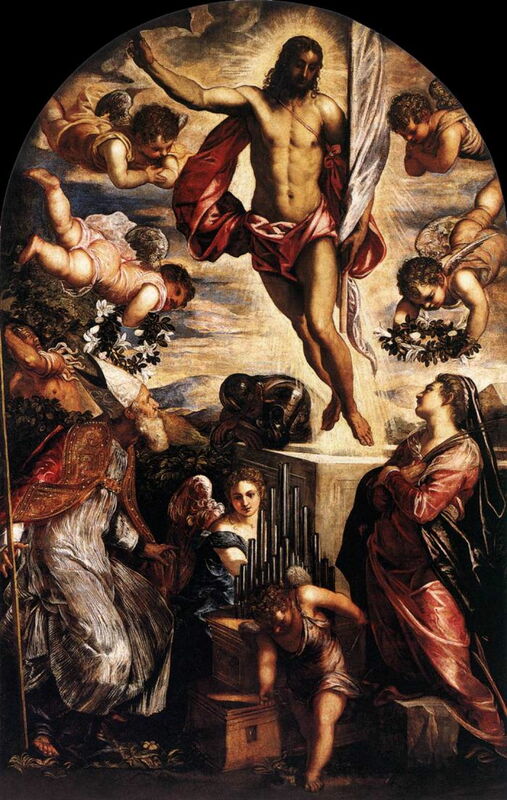 Jacopo Tintoretto (c 1518-1594), The Resurrection of Christ with Saints Cassian and Cecilia (E&I 124) (1565), oil on canvas, 350 x 230 cm, San Cassiano, Venice, Italy. Wikimedia Commons. The Resurrection of Christ with Saints Cassian and Cecilia (E&I 124) features the church’s Saint Cassiano wearing his bishop’s rig at the left, and Saint Cecilia, the patron saint of music and musicians, at the right by a miniature pipe organ. Saint Cassiano is reputed to have been martyred in 303 CE when he was a bishop, during the persecutions of the Roman emperor Diocletian, and his relics were enshrined in Novellara, in central northern Italy. Tintoretto then had three further paintings to make for the albergo in the Scuola Grande di San Rocco, large scenes from the Passion which hang close-packed on the wall opposite his vast Crucifixion. Unfortunately, the nature of the room prevents the viewer from seeing both walls at the same time, which has perhaps lessened their visual effect. 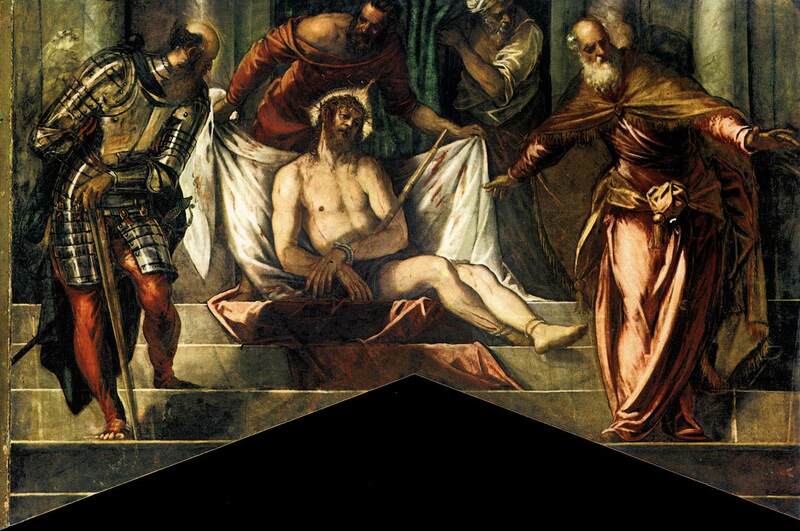 Jacopo Tintoretto (c 1518-1594), Christ before Pilate (E&I 126) (1566-67), oil on canvas, 515 x 380 cm, Albergo, Scuola Grande di San Rocco, Venice, Italy. Wikimedia Commons. 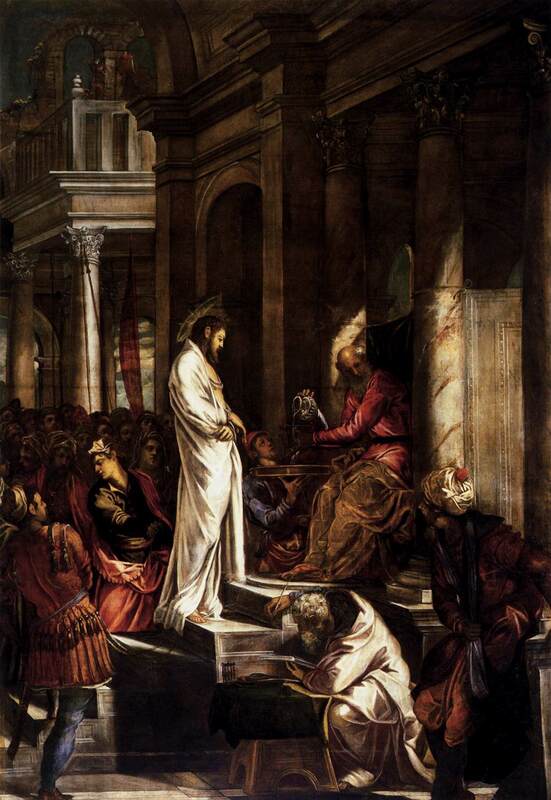 The right of the three shows Christ before Pilate (E&I 126), and like the others was completed between 1566-67. Pilate is the bald and bearded man in the red robe sat on a throne to the right of centre, and is talking to the High Priest or his representative at the lower right. Christ dominates the canvas as he stands, his face and eyes cast down, to the left of centre. His hands are bound by thick rope, a unifying theme through these three paintings. Jacopo Tintoretto (c 1518-1594), Ecce Homo (E&I 127) (1566-67), oil on canvas, 285 x 400 cm, Albergo, Scuola Grande di San Rocco, Venice, Italy. Wikimedia Commons. In the centre is Ecce Homo (‘behold, the man’) (E&I 127), showing a bloody and battered figure of Christ exposed to an unseen crowd, of which the viewer is a member. Christ wears the crown of thorns, and his hair and beard are matted with dried blood. His wrists and ankles are again bound with rope. He gazes into the distance, here looking across the albergo to the image of himself on the cross, providing a subtle forward link in the narrative. At the left is the Ascent to Calvary (E&I 128), which is unusual among paintings of this phase of the Passion for its inclusion of all three of those to be crucified bearing their crosses. Christ is naturally prominent in the upper half of a composition dominated by diagonals, formed by the winding path and the crosses themselves. He and the two thieves are each given assistants who help them with the burden of the crosses. In the upper distance are banners declaring the oversight of the Roman authorities, in their inscriptions of SPQR. Tintoretto links this with the Crucifixion with the inclusion of the tradesmen and their tools who were shortly to be responsible for the mechanics of the executions. Here the thick ropes bind the figures together, as they are used to attach the crosses to their bearers, and to draw the three along to their deaths. Individually, these are major Christian religious paintings. Taken as a series with the Crucifixion opposite, they must be one of the canonical depictions of the Passion. Jacopo Tintoretto (c 1518-1594), Madonna of the Treasurers (E&I 131) (c 1567), oil on canvas, 221 x 521 cm, Gallerie dell’Accademia, Venice, Italy. Image by Didier Descouens, via Wikimedia Commons. Tintoretto then proceeded with some paintings for the Palazzo Camerlenghi in Venice. From among these, his Madonna of the Treasurers (E&I 131) from about 1567 is now in the Gallerie dell’Accademia. At first sight this votive may seem contrived, with the Virgin Mary and a large infant Christ seated in the middle of Saints Sebastian (impaled with the arrows of his martyrdom), Mark, and Theodore. She is being venerated by three camerlenghi (hence its alternate title of the Madonna of the Camerlenghi), who have been identified as Michele Pisani, Lorenzo Dolfin and Marin Malipiero, the fiscal administrators or chamberlains of the day. They are shown in the centre of the painting, and echoing them to the right are their three secretaries. In the lower left corner are the three heraldic shields of the camerlenghi, together with the inscription Tres et unus unanimis concordiae simbolus, expressing the unanimity and concord of the three. Tintoretto’s ingenious composition strengthens that feeling with its measured repetition. 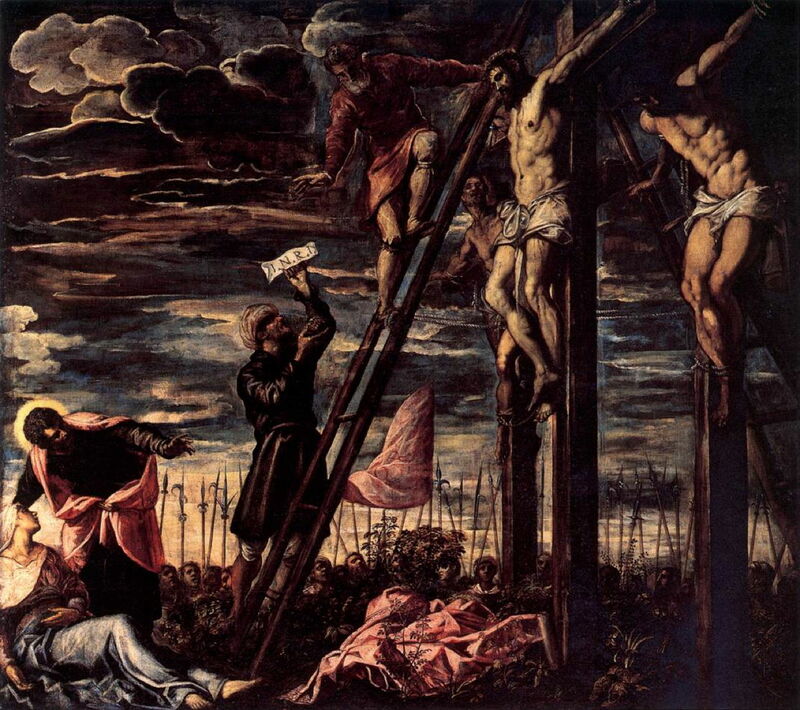 Jacopo Tintoretto (c 1518-1594), Crucifixion (E&I 143) (1568), oil on canvas, 341 x 371 cm, San Cassiano, Venice, Italy. Wikimedia Commons. The following year, Tintoretto made a pair of paintings to complete his work for the church of San Cassiano. The Crucifixion (E&I 143) (1568) is a marked contrast from that in the albergo at San Rocco in adopting a lateral view of the scene on Calvary. This brings the figure of Christ into prominence, as two of his executioners use a ladder to affix the Latin inscription INRI, for Iesus Nazarenus, Rex Iudaeorum (‘Jesus of Nazareth, the King of the Jews’). This puts the smaller group of mourners into the lower left corner, more distant from the foot of the cross. 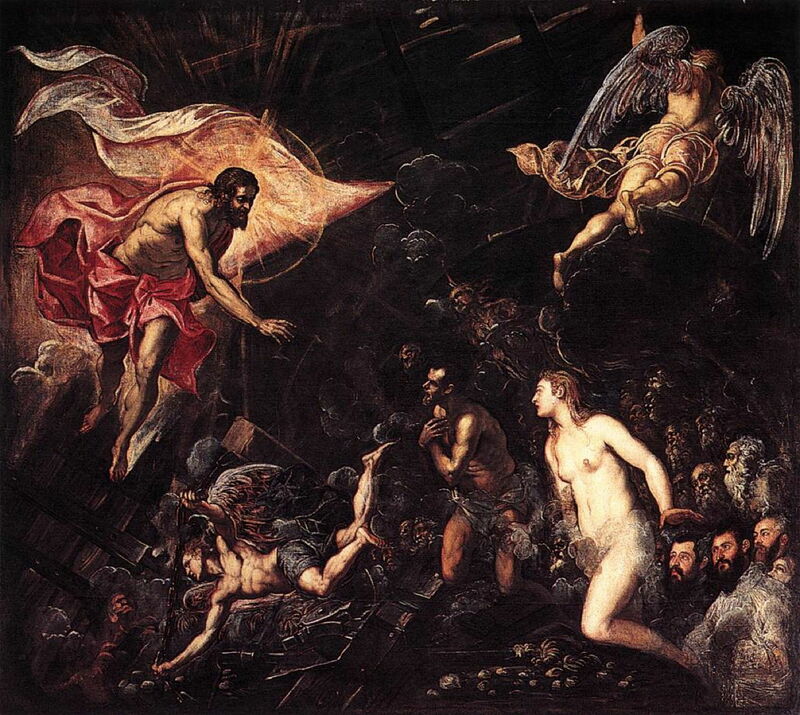 Jacopo Tintoretto (c 1518-1594), The Descent into Limbo (E&I 144) (1568), oil on canvas, 342 x 373 cm, San Cassiano, Venice, Italy. Wikimedia Commons. Accompanying that is The Descent into Limbo (E&I 144), in which the crucified Christ descends triumphant into Hell, where he brings salvation to the righteous in a phase also known as the Harrowing of Hell, or Anastasis, prior to his resurrection from the dead. This is more characteristic of archaic depictions of the Passion. Tintoretto shows Jesus flying in glory through a large hall with an arched roof, accompanied by two angels. He details three figures at the lower right, indicating that they represent donors or sponsors of the painting. Over this period, Tintoretto and his studio had also been busy with paintings for ceilings in the Palazzo Ducale, and the Church of San Rocco. He made a series of philosophers for the library of the Biblioteca Marciana, and possibly around 1571 painted another Last Supper, this time for San Simeone Profeta, which starts my next article.